Before I worked for the library I was a youth worker; I can't give you a precise number, but I would estimate that nearly half of the young people I met living in shelters and group homes had been diagnosed with attention deficit hyperactivity disorder (ADHD). Most of the youth I worked with fit the classic stereotype: high energy, fidgety, exuberant, big personalities; they were people who were easily distracted and sometimes possessed of explosive tempers. I knew that their minds had a hard time slowing down at the end of the night, they enjoyed taking risks, and they needed to move around a lot in order not to feel trapped. I knew they needed lots of reminders, clear directions, and that they responded well to structure and routine. I thought I had a pretty good handle on what ADHD was and I was pretty confident that I could spot it a mile away. My understanding of ADHD was challenged two years ago when someone in my immediate family was diagnosed with this disorder. How was it that this quiet, day-dreamy, and extremely focused person had the same thing going in his brain as those outgoing live-wire youth I used to encounter in my work? The only thing they seemed to share was an extreme frustration with the world and themselves. What I didn't fully understand about ADHD is that it's not only the stereotypical "hyperactive" behaviour we see depicted in popular culture; ADHD manifests through a whole spectrum of symptoms, some of which seem to be the polar opposite of what we generally expect. ADHD is pretty frustrating both for those who have it and those around them. 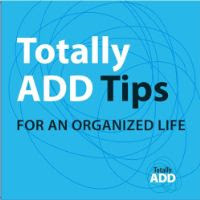 Life can become pretty disorganised and overwhelming for someone with ADHD. People in their lives (even those trying to be supportive) can get frustrated when the person with ADHD is not able to do things that come easily for everyone else. I've spent many, many hours hunting for somebody's glasses/toys/keys that they've somehow lost in our house. I've lost my patience more times than I can count, even when I know it's not within my loved one's control to manage their stuff as well as I would like. 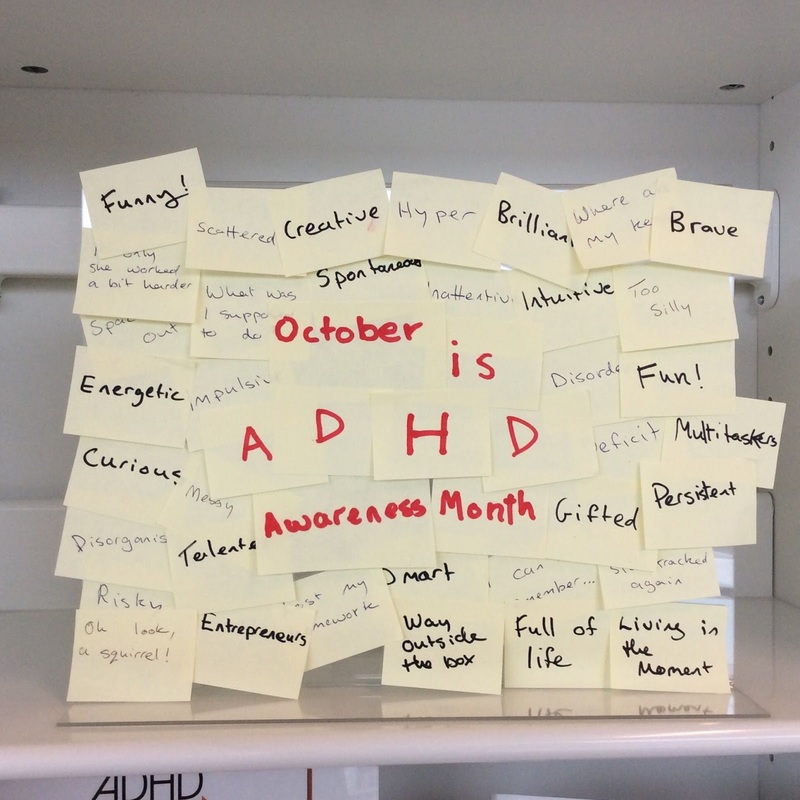 At the same time the people I know who have ADHD are among the very brightest and creative people I have ever met. You want someone who can think outside the box? They've got it in spades. 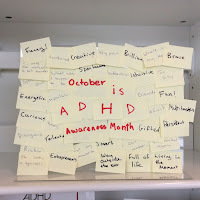 In honour of ADHD Awareness month here are some resources I have found especially helpful in learning to better support the people in my life with ADHD. 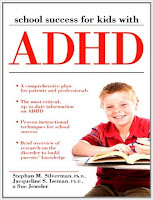 School success for kids with ADHD is a very thorough and detailed overview of the history of ADHD, the current research, and various treatment methods. It provides chapters with specific information for parents, teachers, and students. The information is presented in a matter-of-fact, non-judgmental way and presents chapters on alternative/natural treatments as well as conventional medication and behaviour therapies. The book is from the U.S. so there are some chapters which weren't entirely relevant to us, but I found reading this book made me feel like I understand as much as there is to know at this point (there is still a lot of research going on to pinpoint what exactly causes ADHD and new treatments are always under evaluation). The survival guide for kids with ADD or ADHD is a great resource aimed at school age children; it helps explain to the child what ADHD is and how it makes their brains work differently. There are practical tips for keeping organised, how to eat well, how to manage social difficulties, and what to expect if they begin taking medication. Children are also encouraged work with their school to let teachers know what they need. The book uses fun cartoons to keep young readers interested; I liked it so much I bought a copy for my own family. Canadian comedians Rick Green and Patrick McKenna (both formerly of the Red Green show) were diagnosed with ADHD as adults. They joined forces to create Totally ADD where they offer webinars, videos, and other resources for adults who, like them, may have experienced fear, shame, and stigma surrounding the disorder. Their films are specially produced to appeal to the ADHD brain, providing information in stimulating short segments. Halifax Public Libraries owns a copy of their DVD Totally ADD: tips for an organised life, as well as Rick Green's book ADD stole my car keys. ADHD is often in the news for controversy; some experts believe it is over-diagnosed and medications are being over-used for its treatment. 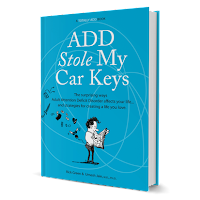 ADHD does not exist caught my eye with its bold pronouncement. I expected something of a conspiracy rant about how the pharmaceutical industry is constantly pushing medication on children but I was surprised to find a carefully thought out case for the idea that many other disorders produce ADHD-like symptoms and must also be investigated to avoid providing the wrong treatment. The author, physician Richard Saul, does in fact recognise a neurological disorder which should be treated with stimulant medication, as is recommended for ADHD, but he believes the ADHD label is being used too often when practitioners should be taking the time to investigate things like learning disabilities, sensory processing disorders, eye problems and other possible causes which require different treatment than ADHD. I think his book is worth a look for anyone who is in the process of diagnosis, or finding that they or their loved one is not responding well to the usual treatments. Some excellent web resources for Canadians include the Canadian ADHD Resource Alliance and the Centre for ADHD Awareness, Canada. ADDitude magazine also has many excellent articles broken down into small bites for the busy brain. If you live in Halifax there is a free ADHD Awareness Expo on Wed. Oct. 14 which brings together different community agencies who can help people living with ADHD. ADHD is sometimes called the "Invisible Disability" -you can't tell from the outside whether someone has it. If they do then coping in school, work, and social settings is often a mighty struggle for them. It is estimated that around 11% of children in North America meet the diagnostic criteria of ADHD -that's a huge percentage of our population; its prevalence has many implications for schools, workplaces, and everyday social settings. It may be your friends, family, co-workers, or yourself whose brain is wired differently from the "norm"; support them by taking some time to deepen your understanding of ADHD.